As many as 70 locations were targeted during the early-morning raids on businesses following three federal indictments. Nearly 1,000 federal and local officers descended on Los Angeles’ Fashion District Wednesday morning, sweeping as many as 70 locations, arresting several people and seizing $65 million in cash allegedly being laundered for drug traffickers including a notorious Mexican drug cartel. The task force began the operation in the pre-dawn hours, with officers raiding businesses accused of laundering ransom and drug money for the Sinaloa drug cartel. 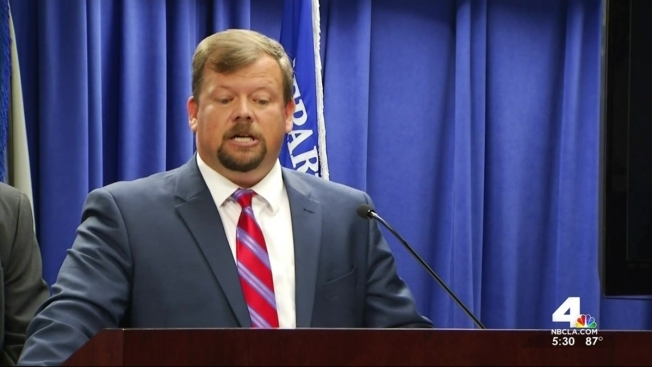 "Los Angeles has become the epicenter of narco-dollar money laundering, with couriers regularly bringing duffel bags and suitcases full of cash to many of these businesses," said Assistant United States Attorney Robert Dugdale. "Because Los Angeles is at the forefront of this money laundering activity, law enforcement in Los Angeles is now at the forefront of combatting this issue." One indictment alleges $140,000 was laundered through QT Maternity for the ransom of a cocaine dealer who had been kidnapped by the Sinaloa Drug Cartel. The man had been beaten, electrically shocked and waterboarded, said Bill Lewis, the FBI's assistant director in charge of the LA field office. Those inside QT Maternity on Wednesday declined to talk and asked NBC4 to leave the store. Another indictment alleges a sting operation caught the principles of Gayima Underwear taking cash for laundering from someone who turned out to be an undercover agent. Shopkeeper Paul Choi, the owner of Blue Note, was not arrested but had his shop searched. "I've been here almost 20 years," he said. "This is the first it's happening."